The RPF’s RPF is a group within the RPF for those individuals who severely interrupt their own or others’ progress towards redemption and have thus dropped into a condition of Liability or lower to the RPF itself. It’s the RPF for the RPF. Am member who cuts across the one chance he or another has been given for redemption has avowedly disenfranchised himself from the group. Those persons assigned to it are segregated from other members of the RPF in berthing, messing and job assignment. It consists of rigorous physical work that is of benefit to the RPF itself. Such jobs would include repair, construction and cleaning of RPF spaces—bathroom facilities, garbage detail, etc. Assignment to the RPF’s RPF originated by any RPF member must be approved by the RPF I/C. Such would normally be originated by the RPF Bosun or RPF MAA. Any RPF’s RPF assignment originated by a staff member outside the RPF, excluding the RPF 1/C, must be authorized by AVC. a) Severely disrupting the progress of others on the RPF. b) Committing continual gross out-tech in the RPF. c) Missing withholds in the RPF. d) Demonstrating no progress towards redemption or preventing others from redeeming themselves. e) Displaying an attitude that “It doesn’t matter” when messing up people or equipment. f) Serious crimes causing the Church extreme burden, withheld and discovered after assignment to the RPF. In this case, the RPF’s RPF assignment may only be carried out with AVC approval. Unpublished Work: © created 1985, 1997 CSI. A Sea Org member may also be sent straight to the RPF’s RPF for exceedingly gross and destructive acts. 1) Enters the RPF’s RPF in a condition not higher than Liability to the RPF. 2) Is segregated from the other members of the RPF in berthing, messing and work. Must stand in a separate line at musters. 3) Is under the RPF MAA for all matters, including production. The RPF MAA may designate another to supervise his or her production. 4) May not speak to any crew member nor may they speak to him/her. May not speak to other members of the RPF unless spoken to. His sole point of communication is to the RPF MAA or the RPF MAA’s designated assistant within the RPF. 5) Puts in additional deck work each day, however, this would not be done in violation of RPF curfews. 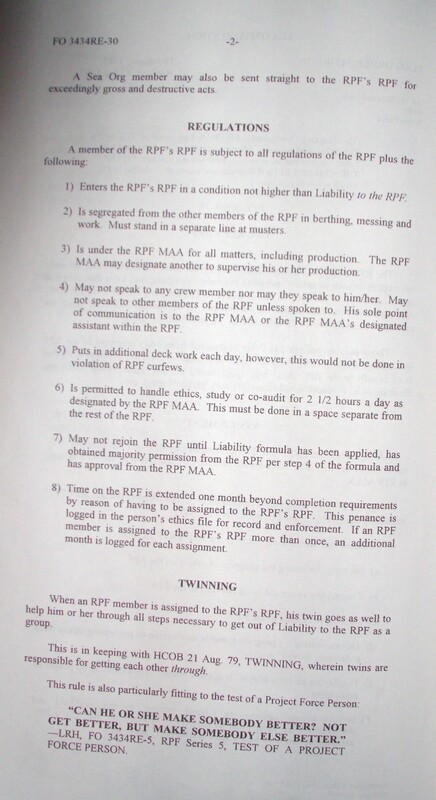 6) Is permitted to handle ethics, study or co-audit for 2 1/2 hours a day as designated by the RPF MAA. This must be done in a space separate from the rest of the RPF. 7) May not rejoin the RPF until Liability formula has been applied, has obtained majority permission from the RPF per step 4 of the formula and has approval from the RPF MAA. 8) Time on the RPF is extended one month beyond completion requirements by reason of having to be assigned to the RPF’s RPF. This penance is logged in the person’s ethics file for record and enforcement. 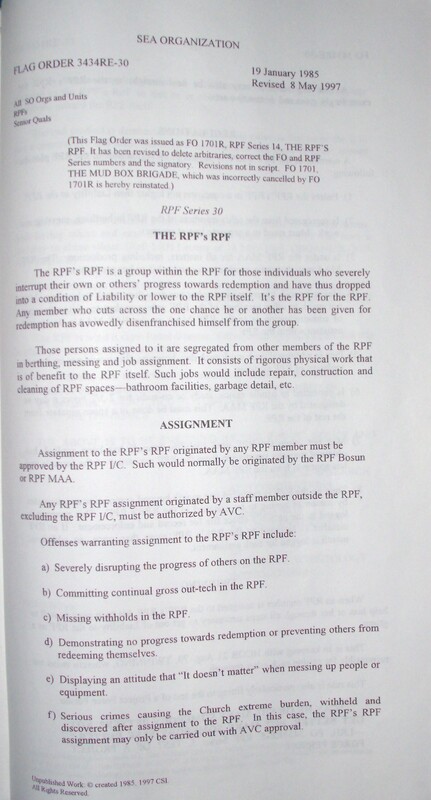 If an RPF member is assigned to the RPF’s RPF more than once, an additional month is logged for each assignment. When an RPF member is assigned to the RPF’s RPF, his twin goes as well to help him or her through all steps necessary to get out of Liability to the RPF as a group. This is in keeping with HCOB 21 Aug. 79, TWINNING, wherein twins are responsible for getting each other through. “CAN HE OR SHE MAKE SOMEBODY BETTER? NOT GET BETTER, BUT MAKE SOMEBODY ELSE BETTER.” —LRH, FO 3434RE-5 RPF Series 5, TEST OF A PROJECT FORCE PERSON. 100% standard application of all ethics tools is the answer for anyone assigned to the RPF’s RPF so that he or she may honestly move up out of low conditions toward the RPF itself. 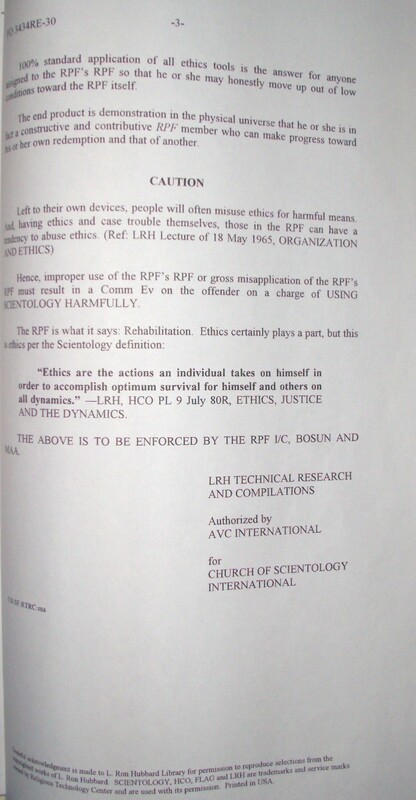 Hence, improper use of the RPF’s RPF or gross misapplication of the RPF’s RPF must result in a Comm Ev on the offender on a charge of USING SCIENTOLOGY HARMFULLY. “Ethics are the actions an individual takes on himself in order to accomplish optimum survival for himself and others on all dynamics.” —LRH, HCO PL 9 July 80R, ETHICS, JUSTICE AND THE DYNAMICS. THE ABOVE IS TO BE ENFORCED BY THE RPF I/C, BOSUN AND MAA.